To be a successful long jumper you have strength, speed, and proper technique. This is another track and field event that requires great body control. A long jumper has several different areas they must master in order to long jump competitively. Long jumpers train with the Myosource Kinetic Bands for the necessary muscle fiber recruitment that track and field athletes need to increase their speed and strength. Resistance training benefits long jumpers because they must generate force throughout their entire body. The lower body Myosource Kinetic Bands strap around the legs, just above the knee, so that the long jumper is not restricted or limited in their movements. Long jumpers are able to use the Myosource Kinetic Bands to warm up, stretch, and practice their skills to increase their speed and strengthen muscles. Track and Field athletes are able to continue all of their regular training with the Myosource Kinetic Bands, providing the resistance to increase stride length, frequency, leg strength and core strength. The approach of long jumping is when the jumper utilizes speed in a measured run to get momentum. It is important for long jumpers to spend adequate time developing the proper number of strides for their approach. They must get into a rhythm to make sure they build up enough speed to get the best take off possible. Long jumpers also have to be accurate in their approach in order to hit their jumping spot perfectly. First, long jumpers must determine which foot they will use to take off. To measure a starting point, the jumper stands on the take off board with their back towards the pit and the back of their foot lined up to the scratch line. The long jumper will then run their designated amount of steps to mark their starting point. After all necessary adjustments are made, the long jumper will establish consistency in landing on the take off board in the same spot every time. Long jumpers must maintain strong hips. They must be able to rotate, sink, and raise their hips to take off. When a longer jumper is in their approach, take note that the last couple steps can be either longer or shorter than the others. During the take off, the jumper’s shoulders should remain slightly behind their hips. 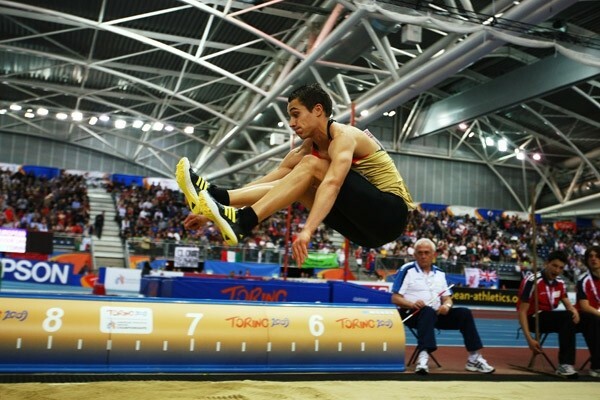 When a long jumper lands on the take off board with the take off foot, it will be slightly in front of the hips in order to hit the board at the mid line. After the last two steps are taken, the arms and the following leg are used to pull the body into vertical acceleration. This is when it is most important the long jumper utilizes their entire body strength. The first portion of the jump is when the long jumper looks like they are still running in the air for four steps. When they hit their peak spot in the jump, the long jumper has pulled both legs out in front with the knees to their chest. On the way down, the jumper begins to straighten their legs, with the knees only slightly bent, until the heels hit the sand. After hitting the sand, the jumper must use their arms and core to build a forward momentum. The Myosource Kinetic Bands work all the muscles at the same time to produce quick, fast twitch muscles that contract faster for greater speed, distance, and jump height. A long jumper wants to get their heels as far from the take off spot as they possibly can. Long jumpers do not want to fall backwards during their landing. When long jumping, the heels need to hit the sand first. This causes the rest of the legs to contract where the hips rise, forcing the long jumpers body momentum to go forward. When a long jumpers hips pull up they rotate to the side in order to keep their momentum forward, which will bring the rest of their body past the feet. Long jumpers need to work their hamstrings, thighs, back, abs, hips, and glutes for a powerful long jump. A strong core helps a long jumper maintain body control in order to utilize all the muscle power throughout the body. The core transfers strength and momentum through the shoulders and arms as well as in the lower body. Hip strength is essential for long jumpers because they need to be able to run fast and use their hip strength to pull their body up and forward during the landing. When watching a long jumper, you will see that the shoulders and arms are used to drive and provide momentum in both running and lifting the body in the jump.